As a lot of my readers may know I’m from the UK. As a type 1 diabetic living in the UK all my diabetes care and expenses are paid for by the NHS (National Health Service). This means that all my diabetes equipment, my insulin pump, my test strips, my blood glucose machines and even any prescriptions are all free. Actually all diabetics in the UK should have a medical exemption card which makes all their prescriptions free. Sorry all my T1Ds who I know go to hell and back with their insurance companies and supplies. That’s another additional fight towards diabetes. I currently have the Animas Vibe which has CGM (continuous glucose monitor) capability. 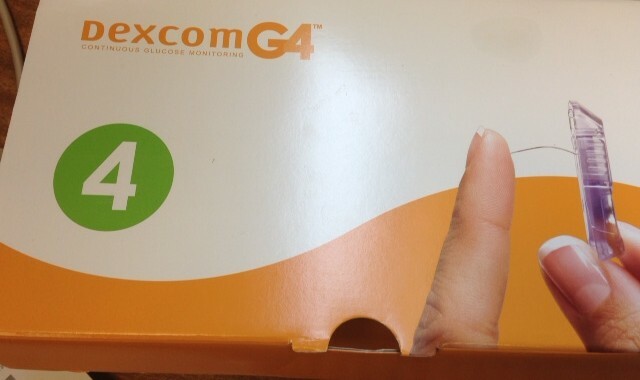 However since I’ve had it I haven’t had a sensor like the Dexcom G4. This is because my diabetes centre have not been able to secure funding for me, until today. YAY! * The sensor is supposed to only last 7 days and at this point the sensor session times out. However after talking to Dexcom I was told that the sensor can last between 10 -14 days. The sensor session can be started again and sometimes last a lot longer than 14 days. I’ve been given the CGM sensor for a month. Now that I’m aware that the sensor won’t last an entire month i’m going to aim to keep this fist sensor on for two weeks. I’ll be documenting my experience with the sensor and my BGL over this month. As I said funding is limited therefore sensors are few, this also means that every two weeks I’ll have to return the sensor to the diabetes centre and get a new one fitted. If I wanted to have the sensors as a more permanent thing I’d have to fund it myself. I feel I need to explain why I of all the T1D’s was able to get a sensor. Since I had my little boy I’ve progressively suffered with severe hypos, especially during the night. For all you T1Ds out there, you know what night time hypos means. Diabetes is a scary thing to have to deal with on a daily basis, without having to deal with extreme lows in the night. For the non-D’s this means that I can be up several times during the night when others are fast asleep, checking my BGLs in fear of them dropping too low. These lows can cause what we call a rebound (this is when the low BGL rebounds up and you end up with a very high BGL reading). The sensor will allow me to catch some of these severe lows. So if I was to go with the transmitter, receiver and the box of 4 sensors that would mean I’d have to spend £1214.50 to start the whole process. Plus I’d have to factor in the cost of the transmitter and receiver breaking down so all together it would cost £1539.50. One good thing is that I’d get a VAT exemption, so that good ha! It’s definitely something to think about. For now I’ll see how this trail period goes before I make a decision. Very exciting! I think you’ll learn a TON just by being able to watch your BG’s and how they respond to things. Keep us posted! Oh man! Hopefully they get a move on and speed the process up. keep me posted. If you have the Vibe, I would think you don’t need a separate receiver (they’ve got a tendency to break anyway, so I’m told…). When it comes available in the US, I am strongly considering switching to that system. Oh really? I’ll have to look into that. Not having to include the receiver into the cost would be a huge savings. I previously had the Animas 20/20 and switched over to the Vibe this year the difference to the 20/20 isn’t that great. My lows tend to be in the night so knowing when they are about to happen will really help with my overall control. When will be Vibe be released over there? I really thought they’d come out by now.